Note: Once purchased, right click on the download links on the confirmation page to save the mp3 file and the Q&A PDF file. When learning to meditate, it is best to begin with the Surya Ram Meditation. After two months, we recommend adding the Surya Ram Mantra Meditation. Just like the Surya Ram Meditation, the Surya Ram Mantra Meditation is completely natural and effortless. It is a method that provides you with a bigger and more powerful engine. Throughout the ages, this technique has been revered as sacred, so please learn it with this held in your heart and mind. 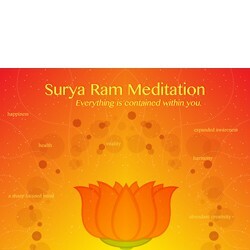 The Surya Ram Mantra Meditation instruction is free. The cost shown is for handling. We have not posted this technique online to help ensure that only those who are sincere in their interest will receive it. As always, if you have any questions or comments, please contact us.